I read that opening paragraph over and over again, hoping that through the sheer force of repetition its truth will write itself deep into my being and manifest in my every action. We are indeed entering a new age and I hold great hope that it will be one of Nature. While the current political climate may strike a blow to such optimism, a lack of federal or even state leadership has opened the way for decentralized change. The task before us is to preserve as much diversity of life as possible to bring through the bottleneck with us into the new, unknown, and radically changed world on the other side. But how? When it comes to innovative ideas for how to continue on this planet, Bioneers, the annual conference founded by Ausubel and his partner Nina Simons, has been charting the way for the past twenty-two years. Bioneers is a forum that brings together top thinkers from the humanities and the sciences who share a humbleness before nature and espouse the view that our salvation can only be found by working with, rather than against, natural systems. In Dreaming the Future, Ausubel has gathered twenty-four essays that, like the thinkers featured at Bioneers, highlight an effort to shift our mindset from taming Mother Nature to mimicking and working in concert with her to achieve mutually beneficial goals. After spending the entirety of my 20’s within the safe confines of academia, I entered my 30’s having not yet truly engaged with my larger community. I felt this lack and found myself, as many others have, deeply yearning for a more authentic way of being; a way that was rooted in place, intertwined with neighbors, and connected to the very earth. For the first time I was open to learning about environmental toxins, the tidal wave of plastic pollution, and the vast inequalities in the world. I became desperate to find an elusive “right” way to live, but every choice seemed imperfect, leaving me overwhelmed and full of despair. I found my personal antidote to such pessimism after having a baby. Witnessing first-hand how a tiny human, new to the world, could connect with the earth taught me a sense of reverence for Mother Nature as teacher. A simple drop of water could capture his focus completely, leading him to fully immersive, joyful exploration with the entirety of his body. His interactions with simple things – water, leaves, grass – were completely present in the moment and I realized that the natural world had my son’s full attention and he was listening. Why couldn’t we? Children remind us that we humans are not separate from our environment. In Dreaming the Future, Ausubel argues that this is a crucial point for us to remember as we forge ahead. His book explores the ways in which we have butted heads with the natural world, discusses in-depth the problem of corporate power, and shares inspiring examples of how individuals have wrought real and tangible shifts in their communities by restoring ecosystems, enacting social justice, and bringing people together. Here we have municipalities choosing to employ the precautionary principle and banning pesticides in public places, small Pennsylvania townships successfully standing up to agribusiness to stop the spreading of human waste sludge on fields, and individuals using nature’s favorite form—the spiral—to transform everything from electronics to transportation. Ausubel has dreamed for us a future in which individuals are empowered, nature has legal rights, and connection—with the earth and with each other—takes precedence over the bottom line. To write it out this way seems wildly optimistic if not delusional, but Ausubel is not at all naïve nor is he a purveyor of magical thinking. His writing is at times funny, often profound, and always informed by his deep knowledge and understanding of history, science, and politics. By returning to our childness – our state of wonder and unity with our natural surroundings – we can better see the wisdom that is all around us. Our task is large, but the solutions have already been developed by nature. We only have to quiet our insistent human voices and listen. Courtney Cable - holds an MA in Intermedia Art and is trying to carve out a gentle, creative, and sustainable life on the flat plains of Iowa. Her writing has been published in saltfront, Kindred, Natural Child Magazine, Bamboo Family Magazine, and she has been a frequent contributor to Rhythm of the Home. 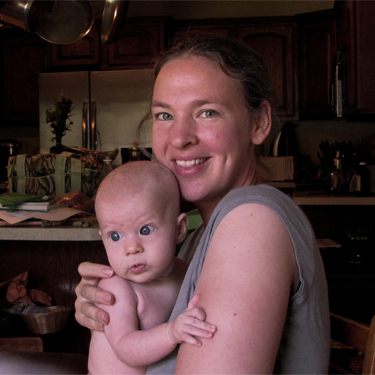 She writes about parenthood, creativity, food, and nature at alifesustained.blogspot.com.